Pictured to the left of the 441st MID are the men of the 402d Army Security Agency (ASA) Detachment (in front of the yellow metal shed). The men of the 402d ASA Det and 441st MID were merged into what became the 10th Military Intelligence (MI) Company (Airborne) which was immediately activated as the MI unit organic to the 10th SFG(A). MAJ Lorentzen and 1SG Kyles were reassigned to HHC, 10th SFG(A) as Group S-2 Officer and NCOIC, respectively. By 1979, the two battalion and one group HQ support teams were known as MI Support Teams or MIST. The MIST provided tactical intelligence, counterintelligence, order-of-battle and imagery interpretation capabilities in garrison and when deployed. In garrison, the MIST continued their intelligence support of the ODA area studies program, JCET briefings/debriefings, and current intelligence evaluations. The 441st MID provided MIST in support of the Group SFOB and two battalion FOBs participating in FTX FLINTLOCK in 1979 and 1980. The MIST also deployed in support of the SFOB and two FOBs during the Group’s ARTEP in October 1979. Meanwhile, unit training focused on MIST and individual skills needed to support 10th SFGA war plans, including affiliation training with the 44th Civil Affairs Company (USAR), Warwick, Rhode Island. 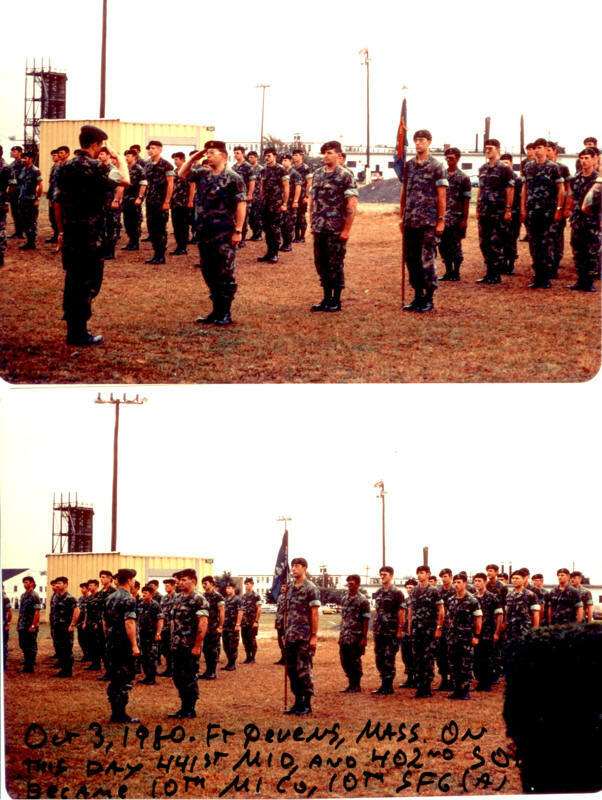 The 441st MID was deactivated on 3 October 1980. Its men, and the 402d ASA Det, were reassigned to the newly-organized 10th MI Company organic to the 10th SFGA. PFC Warren W. Walker, Jr.
1SG Richard W. Kyles, Jr.